U.S. #O121 was issued on this day in 1910. 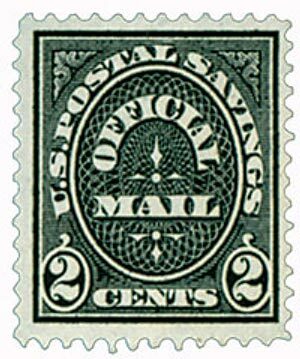 On December 22, 1910, the US Post Office Department issued its first Postal Savings Official Mail stamp. 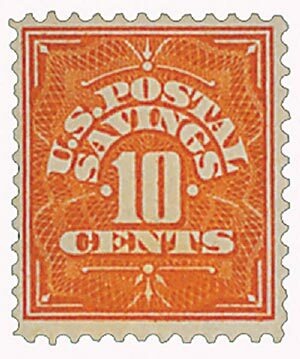 On June 25, 1910, the US Congress approved an act to establish the Postal Savings System. The Postal Savings System was established to serve small investors living in rural communities. Under the program, lower- and middle-income individuals were able to deposit funds at their local post office. Postal Mail stamps, given as proof of the deposit, were redeemable in the form of credits to Postal Savings accounts. President Theodore Roosevelt first promoted the Postal Savings System as a solution to public distrust of traditional banks. A congressional act established the system effective January 1, 1911. Under the act, the Postal Savings System paid two percent interest per year. The minimum deposit was $1.00 with a maximum of $2,500. The act also directed the Postmaster General to issue stamps in five denominations to be used instead of traditional Official Mail envelopes. The first of these stamps was issued on December 22, 1910. 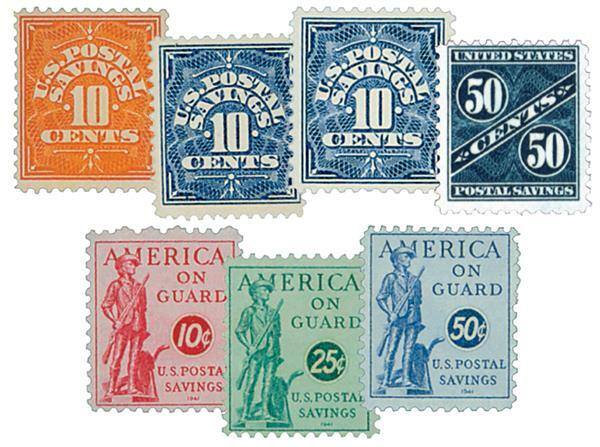 These stamps were used on mail pertaining to the business of the US Postal Savings System. U.S. #O121-26 – Complete set of 6 Postal Savings Official Mail stamps with FREE album pages. The Postal Savings System proved to be very popular among rural Americans, immigrants familiar with similar systems in their native countries, and working people who were unable to conduct transactions during the limited hours of traditional banks. Postal Savings deposits could be made six days per week between the hours of 8 a.m. and 6 p.m. The system eventually extended to over 5,000 post offices in 48 states. U.S. #PS1//PS13 – Set of 7 Postal Savings stamps with FREE album pages. Though the Postal Savings System continued for years to come, the official stamps were discontinued in 1914. Postmasters were instructed to return the unused stamps, which were destroyed. Click here for more about Postal Savings stamps. 3 Responses to "This Day in History… December 22, 1910"
Thanks for the information not generally known? Does official mail stamp has any value for public? Lots of history in stamps! !